Now I’m starting to get mad. The article states that HTC told that user to perform a Hard Reset. I have already been told this once before by HTC over another issue that seems to have just “gone away”… (I can’t remember the exact error but it was something to the effect of “The process com.htc.bg has stopped unexpectedly.” and continuously kept popping up randomly and didn’t seem to affect any functionality whatsoever. I managed to dig up the ticket to HTC). Has anyone found a solution to this bug that doesn’t involve a hard reset? I hear this problem could result in a bricked phone which I do NOT want. I’m having trouble finding a working fix to this. 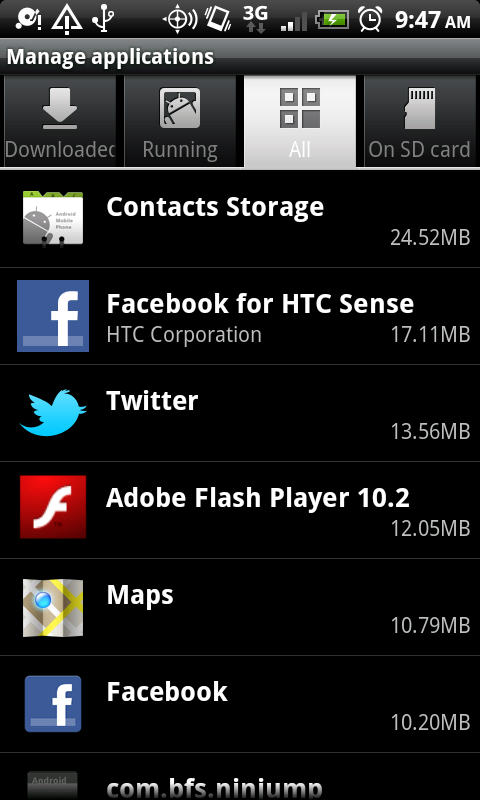 I have an HTC Incredible updated to the latest version of Android (I think it’s 2.2). Please let me know the solution to this issue. Thanks. Thank you for your email regarding your HTC Incredible. We apologize for the issues you have experienced with the available memory space. If the device is running low on memory, even through it may show plenty of memory available, it is possible that one of the applications on the device is close to its allotted memory limit. To check this, tap Menu while on the Home screen followed by Settings>Applications>Manage Applications>all tab>Menu>Sort by Size. This will place the highest memory using applications at the top. Go through the top 5 listed applications and select Clear Data and Force stop. Note that Clear Data will remove all information from the associated application. Also, when doing this, we recommend that you skip over Contact Storage and Calendar Storage listings as these will remove your contacts and appointments. If you have any email accounts set up on the phone, you can also try deleting the Mail folder from either the storage card or internal memory. This folder is only able to store a set amount of information and can cause this error if it is getting full. To do so, connect your device to a PC with the provided USB cable. Then select Disk Drive>Done from the Connection Type window on the phone itself. You should then be able to access the phone as a Removable Disk on the computer itself. Locate the delete the Mail folder here. If the issue is still present, you can attempt a factory data reset on the phone. To perform the reset, press Menu>Settings>SD & Phone Storage>Factory Data Reset. This will remove all data from the device and reload the current operating system. As such, you will want to back up any personal information remove the micro SD card, if present, prior to following the above steps. If needed, you can back up your contacts to the SD card by opening the people application and select Menu>Import/Export/Export to SD card. You should only need to select the Phone contacts as the Google and Exchange contacts should already be saved to their respective sources. So if I was to follow through on their instructions and clear ALL the data above, I’ll gain a grand total of: 50.2MB… WOW. 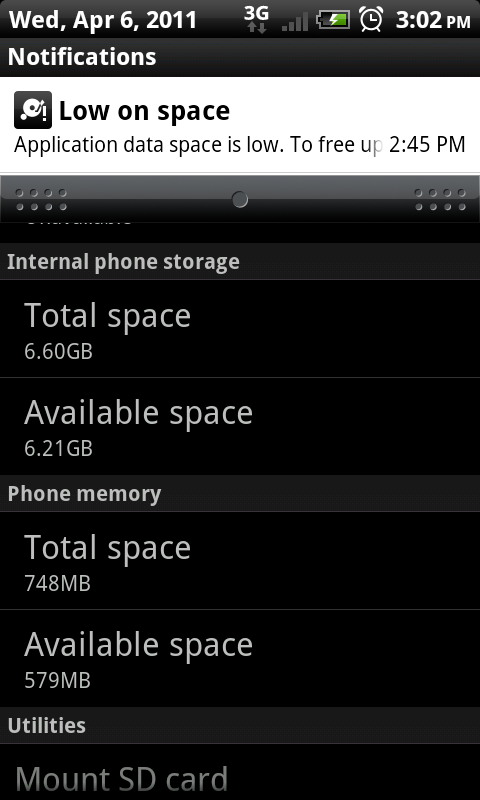 That should make a WORLD of difference on 8GB of Internal storage. 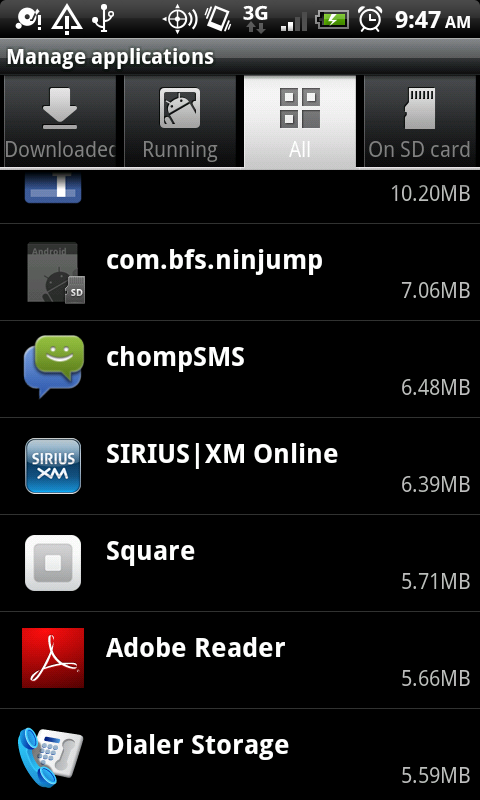 For those not good with math, that’s about 0.625% of the entire storage space on my phone. So, what HTC is telling me, that if I clear less than 1% of data stored on my phone it will resolve the low disk space error?? I’m not a super genius, but I know that 50MB on this device is not much at all, and I can probably expect that amount to fill right back up as soon as it’s cleared away, causing the same problem all over again. In addition to that, I’m erasing all the data that makes this phone “Incredible”. Checking Facebook and Twitter from the palm of my hand! I was unable to find the Mail folder anyway. Thanks for the suggestion HTC. Lastly, Step 3: Factory Reset… I’m sorry but this is an unacceptable suggestion from the phone manufacturer. What a horrible solution. The stupidest part of this “suggestion” is they tell you to Backup the things that are stored in the memory… So as soon as you complete the factory reset, you’re going to load that stuff back onto your phone and still have the SAME PROBLEM!!! Why didn’t HTC address the fact that this might be a *bug* with this phone? I decided I’d try some suggestions for the 1000s of pages reporting the same issue, but none of them really “resolve” this issue, it returns quickly. The only solution is to *CONSTANTLY* clear out the data from the apps that you use your phone for… like Twitter and Facebook. I feel like this issue is a software problem that needs to be addressed. I am unsatisfied with the suggestions provided and would like to request further research/action on this issue. I bought this phone to use it. I don’t want to constantly have to be worrying about disk space and clearing the data that I use the phone for in the first place. Do you understand what it means to ask me to clear the data that I use the phone for ANYWAY? 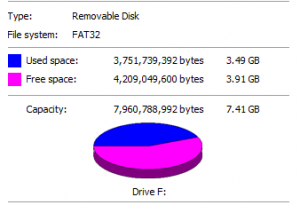 If the application has limited disk space, then use all of it and then clear things from the back forward. This is simply something I need to “know” about, not be notified constantly about. Put it in the “help” menu of an app. The disk space warning affects the functionality of my entire device making it useless. And I don’t plan on carrying a useless device around with me. I will find something else that works. Thank you for your reply. I understand how this is frustrating for you. Although your device contains 8GB EMMC (storage), very few applications default their cached information to this location. The Internal storage of 748MB is the main location for application and cache data. This is how Android was intended to work. On a side note, the HTC Mail application does store information to and external source, i.e. EMMC or Storage card. I recommend plugging your device into a PC as a Disk Drive and locating the .Mail folders. Delete these folder and you should see more space become available. I do apologize for any inconvenience that you may have experienced. 2. The software was designed in a way that require Factory Resets on a regular basis. Please address this that it IS a problem and needs resolution. It seems like no other Android phones experience this issue like it persists on the Incredible, including other HTC phones. If what you’re saying that the notification is a result of low space on the Internal 784MB space, I am only using about 20%. 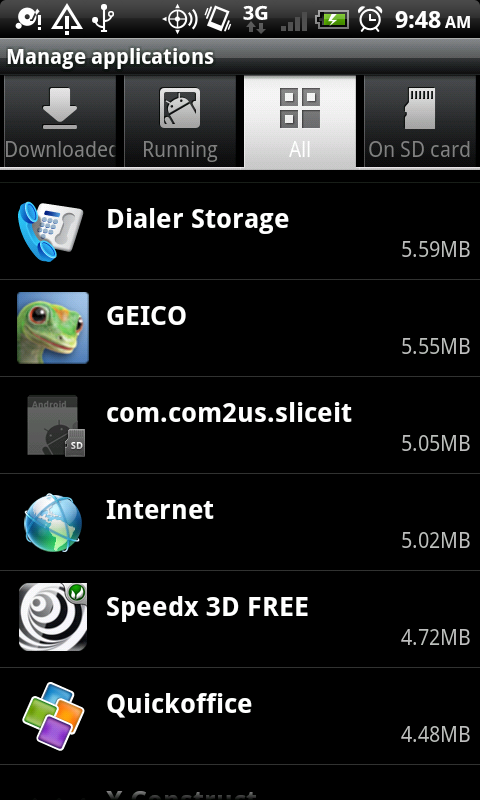 So apparently the phone things my disk space is low at or around 25% usage? This seems like a memory read problem. I have not found a working solution anywhere on the internet but the 1000s of other users dealing with this problem. I feel it’s time to release a patch for this bug. 2. Look through ALL my applications for ANY apps still on the phone. If I can move it to the SD Card, I do so. If I can’t and it’s something I only sometimes use, sorry app developer, but I have to get rid of it. I’m writing to let you know I’m unhappy about the resolution, I am reluctant to ever get another HTC phone again, nor will I recommend them, because there are about 100 other Android phones on the market that have similar features and hardware specs and do not experience this issue. On a side note, I’d just like to say the issue above is not the only one that has left me considering replacing the ROM with an alternative. While some of the HTC software that comes bundled with the phone is nice and I use daily, there are others that I don’t want to use and may NEVER use. Like Slacker Radio, Skype, HTC Stocks and News. Why is it necessary that these apps are CONSTANTLY running in the background? Thankfully I found an app called Titanium Backup that allows me to get rid of these applications, otherwise I would have been looking for a new ROM or Kernel for sure. I’ve had this same issue for about a week now. 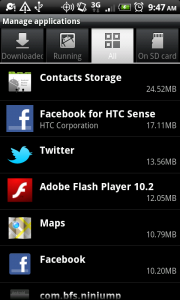 I signed out of facebook for HTC sence and the notification went away. Signed back in to facebook for htc and its back again. Keep in mind I use facebook for Android as my primary facebook app, I only use facebook for HTC to keep my contacts sync’d and updated. Trying to figure out a work around for this myself. Just thought someone should know. This bug kills me. I’ve been looking for a fix for months. It’s very annoying. There is now a hotfix available. Exit your settings and open the Internet browser. Enter “dl3.htc.com/misc/inc8049.apk”, this will download a hotfix. If it didn’t start the install automatically, go to your download folder and Open the file “inc8049”. Ok, who are you and where did you find that? Why didn’t HTC tell me about it? I was practically begging for it! Will this work on the latest Incredible update (Android 2.3.4)? I am runnig Android version 2.3.4. I found the fix on the HTC Forums. Somebody else actually talked to HTC support and posted what they were told. (“http://community.htc.com/na/htc-forums/android/f/91/t/8475.aspx?PageIndex=4” Read the post from “MitchyBoy.”) I was also getting frustrated. I was uninstalling more and more apps, constantly clearing my cached data, all that. Finally, I tried the hotfix. It really works. The fix was developed to correct the problem of people not receiving text messages. I am guessing the low memory error and the not receiving text messages are caused by the same problem. Since then, I’ve been reinstalling applications that I used before the memory problem. Apparently not everybody at HTC is even aware of the fix, so I am going to the various forums and posting the solution. I didn’t try this, but maybe if you call HTC and say your phone is no longer receiving text messages instead of the low memory message, they might direct you to the hotfix. I have had this error on and off the entire time I have had this phone. I get the “low disk space” error with over 500MB internal free, and it gets to the point where it refuses to even open a browser because it thinks it has no space. I’ve missed emails, texts, and calendar alerts because of this. This is the worst smartphone I have ever had. I hate it with the burning hatred of a thousand suns. I was so excited when I first got this phone, but it has been such a horrible experience (with no helpful information coming from the vendor) that I will never, ever buy another HTC product. No other phone has this issue, even the Incredible 2 one of my family member’s has doesn’t have this problem, so there is a fix for it out there, they just won’t (or can’t) give it to us. Never, ever, ever again will I buy another HTC product.